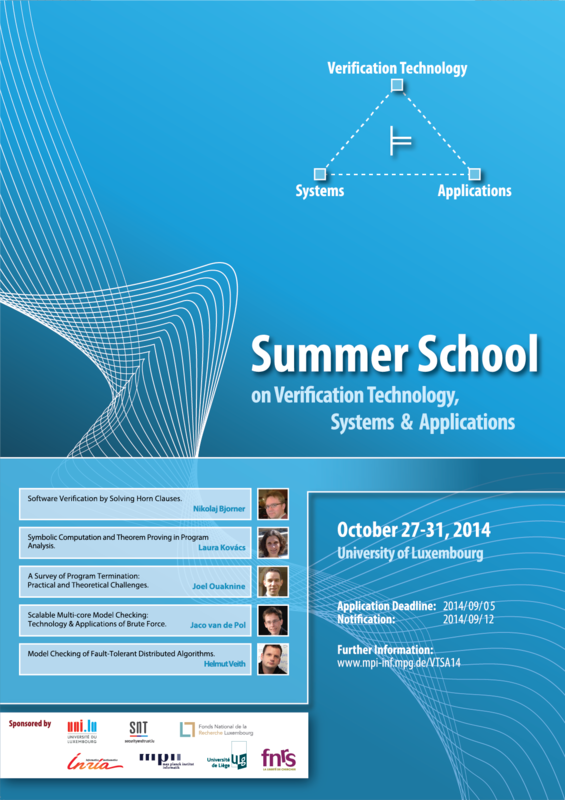 The summer school on verification technology, systems & applications takes place at the University of Luxembourg from October 27-31, 2014. 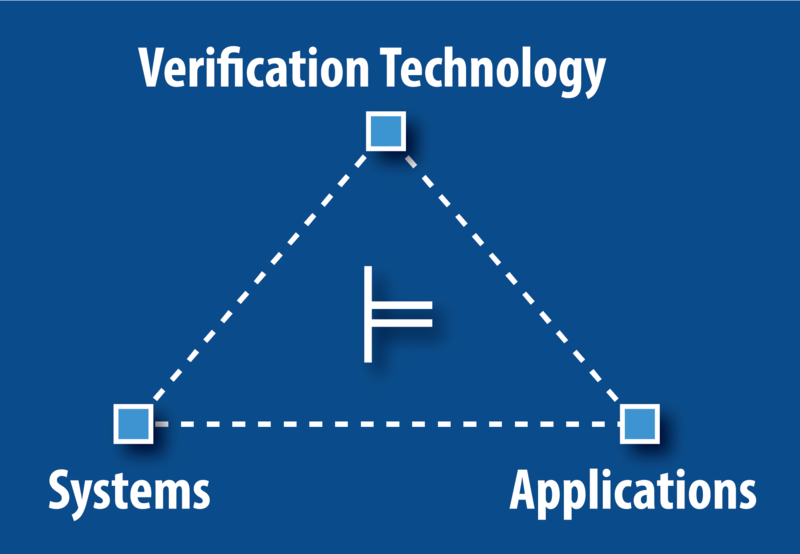 We believe that all three aspects verification technology, systems & applications strongly depend on each other and that progress in the area of formal analysis and verification can only be made if all three aspects are considered as a whole. Our five speakers Nikolaj Bjorner, Laura Kovács, Joel Ouaknine, Jaco van de Pol, and Helmut Veith stand for this view in that they represent and will present a particular verification technology and its implementation in a system in order to successfully apply the approach to real world verification problems. until the 5th September 2014 (expired). Notifications on acceptance/rejection will be given by 15th September 2014 (expired). The registration will be open to accepted applicants starting on 15th September 2014. Please note that the application deadlines of the summer school and the student grants coincide. All lectures will take place in room B001 in Weicker Building of SnT. Note: The Student sessions give all participants the opportunity to discuss their PhD/Master topics with the speakers, the organizers and further senior researchers. The topic can be introduced by a short talk (10 minutes) and/or a poster. We encourage the participants to contribute to the student sessions. They are a great opportunity to discuss interesting topics with world leading experts in a relaxing atmosphere. Satisfiability Modulo Theories (SMT) solvers offer a compelling match for software tools, since several common software constructs map directly into supported theories. The lecture takes as starting point the state-of-the art SMT solver Z3, developed at Microsoft Research. We revisit a central problem in program analysis, model checking and verification - synthesizing sufficient inductive invariants. It is formulated as solving satisfiability of Horn clauses: We exploit that models of constrained Horn clauses correspond directly to certificates of program correctness. We examine algorithms used in software model checking as strategies for solving Horn clauses. 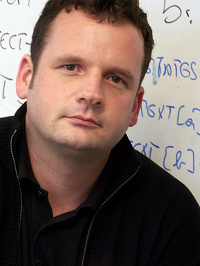 These algorithms include, variants of bounded model checking, symbolic execution, bottom-up saturation with finite relations, such as hash tables, BDDs and three-valued bit-vectors, backwards chaining with tabling, fold-unfold transformations, variants inspired by IC3 and interpolation procedures. Z3 contains implementations of most of these algorithms and they are used in various program and network analysis applications. Automatic understanding of the intended meaning of computer programs is a very hard problem, requiring intelligence and reasoning. 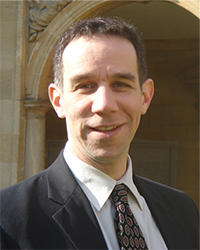 During this lecture series, we will present a new method for program analysis, called symbol elimination, that uses first-order theorem proving and symbolic computation techniques to automatically discover non-trivial program properties, such as loop invariants and loop bounds. Moreover, symbol elimination can be used as an alternative to interpolation for software verification. We first describe how symbol elimination can be used for polynomial and quantified invariant generation, by using Groebner basis computation, quantifier elimination and saturation-based first-order theorem proving. Next, we detail how Craig interpolants can be automatically constructed and optimized from symbol eliminating first-order proofs. Symbol elimination is implemented in the award-winning first-order theorem prover Vampire. We will discuss implementation details and report on our experiments with using symbol elimination for generating and proving intended safety properties of academic and industrial benchmarks. In the quest for program analysis and verification, program termination -- determining whether a given program will always halt or could execute forever -- has emerged as a pivotal component. Unfortunately, this task was proven to be undecidable by Alan Turing eight decades ago, before the advent of the first working computers! In recent years, however, great strides were made in the automated analysis of termination of programs, from simple counter machines to Windows device drivers. In this lecture, we will survey a cross section of topics ranging from the history of program termination to the development of modern tools such as Microsoft Research's Terminator, presenting in the process some of the practical and theoretical challenges that remain and that we expect will drive the field for the foreseeable future. Model checking realizes the dream of automated system and software verification, improving system quality, avoiding disastrous failures, and lowering development costs – or does it? In reality, big scale application of model checking is hampered by limited scalability due to the state space explosion. Potential solutions are state space reduction by exploiting symmetry or abstraction, clever data structures and algorithms and by exploiting brute-force computation resources. 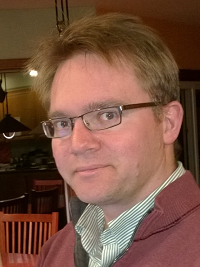 This course will focus on scalable multi-core model checking. 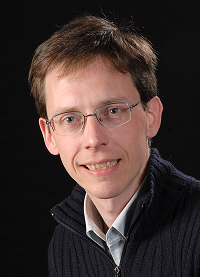 I will share the technological development that our research team at the University of Twente has achieved over the last five years, in concurrent data structures and parallel algorithms for model checking. How to build a scalable model checker? It all starts with concurrent data structures. In order to obtain ideal speedup, tens of processors must be able to access data in shared memory in a correct manner, without blocking each other at any time. For model checking, the design of a shared hash table to store the large state space is crucial. We managed to achieve ideal speedup up to 48 cores, even in the presence of algorithms and representation techniques that achieve enormous compression of state vectors. The other ingredient is parallel algorithms. In order to speed up complicated model checking tasks beyond reachability analysis we developed a new method for liveness checking. Despite the inherent complexity of parallelizing DFS, we propose Parallel Nested Depth First Search. It is based on NDFS for LTL model checking. Parallel workers apply random search by running their own NDFS. Conflicts due to perturbed DFS orders will have to be avoided or repaired. We will show how far multi-core model checking takes us when it comes to applying symbolic techniques in model checking. In particular, we can show successful experiments in parallel partial-order reduction, parallel computations with Binary Decision Diagrams (BDD), and parallel model checking of Timed Automata with a symbolic representation of clock constraints. Finally, the course will show real world applications that became possible by high-performance model checking. We will see a variety of applications, ranging from railway safety, analyzing PLC-like software, to systems biology. We recently introduced an abstraction method for parameterized model checking of threshold-based fault-tolerant distributed algorithms. The method requires understanding of several verification techniques such as parametric abstraction, finite state model checking and abstraction refinement. In this course, we will describe how all these techniques interact in order to achieve a possibly high degree of automation. All participants are responsible for their own accommodation arrangements. Note: Luxembourg is a small country and some of the below partner hotels may have released rooms for public bookings already, which means that availability and prices are no longer guaranteed. We therefore strongly recommend you booking your accommodation as soon as possible! submit it via email (after scanning) or by fax (see form sheet for more information). The Summer School 2014 will take place at the SnT at the University of Luxembourg. 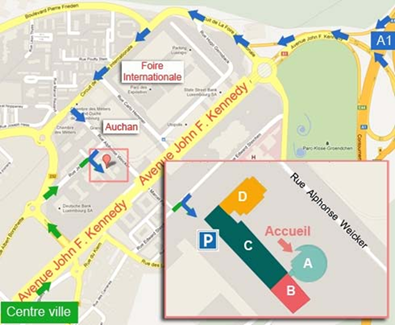 Parking places for visitors are on the -1 level in the underground parking of Weicker building (in the red box of the image above). When you arrive at the entrance of the parking, please ring at the gate. The guard will know about the visit so he will open to you without any problems. People will need to take the lift to go up from the underground parking to the ground floor (reception desk). Luxembourg has train connections to all of its neighboring countries: France, Germany and Belgium. It is, however, also very feasible to travel by train when coming from the Nether- lands or the UK. When planning train travel in Europe, the website of Deutsche Bahn is an excellent source of information, since they have a travel planner that covers pretty much entire Europe. Belgium. A direct train goes once an hour between Brussels and Luxembourg. A one-way ticket costs about 30 Euro. The train looks decent and modern, and the trip Brussels-Luxembourg takes about 3 hours. Another possibility is to take the train Li` ege-Luxembourg, which might be more direct for some parts of Belgium, but it has to be mentioned that this train makes a lot of stops. France. Rail connections between France and Luxembourg were greatly improved with the opening of the new TGV Paris-Luxembourg. The trip takes just over 2 hours. The Netherlands. Train tickets from the Netherlands to Luxembourg can be bought at the domestic counter or even from the standard NS ticket vending machines (press “Belgium / Luxembourg”). When buying a ticket one has to specify whether one is going over Roosendaal-Brussels or over Maastricht-Liége. United Kingdom. Going from the UK to Luxembourg by train is actually a quite viable option. It is possible to buy a Eurostar ticket (to Brussels) that is valid to any station in Belgium. In that case, one may want to use this ticket until Arlon, the last station in Belgium before the border with Luxembourg. The additional return ticket Arlon- Luxembourg can be bought at the railway station in Brussels (where you can also ask whether conditions are still the same since our university staff used this possibility). The ticket can be bougth at the driver for 2€ that is valid for 2h. It is also possible to buy a carnet of 10-tickets for 16€. Another interesting local transport alternative is to move around by bicycle. The City of Luxembourg has several fully automated bicycle rental stations, including one that is nearby the summer school site. A subscription for one week costs only 1€. The idea is to take a bicycle from one rental station and return it to perhaps another. If the trip takes less than 30 minutes, it’s for free. Otherwise one starts to pay one euro per hour, after the first 30 minutes, with a maximum of 5 Euro per day. Keep in mind that you’re allowed to keep your rented bicycle for at most 24 hours. 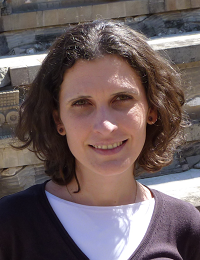 The summer school is organized by the Montefiore Institute, University of Luxembourg, INRIA Nancy, and the Max Planck Institute for Informatics Saarbrücken.